Late January — This is the time of year that winter always starts to feel too much for me. I thought I was making it through pretty unscathed this year: We’d had almost no snow so far here in Boston, which meant no shoveling, no scrabbling for precious, hard-dug-out parking spaces, no arguing with neighbors about the proper way to pile up the snow. But all that changed — and changed dramatically — this week with what one meteorologist said was the sixth biggest snowstorm in Boston in recorded history. Before it even came it caused tension in my house over an unregistered car that our subletter had been storing for months, without permission, in the driveway. Our landlords, my housemate, and the downstairs tenants who share the driveway all wanted it moved and the snowstorm brought the issue to a head. I felt that if it wasn’t moved before the snowstorm it was going to be stuck there till March or April. The subletter couldn’t find the title and was apologetic but refused to move it before he got it registered. I pushed the issue more than I would have if it weren’t for the coming storm, and emotions were high all around. Then the storm came and things just kept getting worse. We had more disagreements with our subletter over how to shovel, because there is just so little room to put all that snow. Our neighbor once again expressed disapproval about how we were shoveling. Another neighbor’s van took up one and a half parking spaces, so I couldn’t use the spot I’d dug out. And I heard from my mom that she’d fell and hurt herself, and was taking longer than expected to recover. Now it is snowing again, and more coming on Monday. We haven’t come to a consensus with our subletter about the shoveling, and the snow piles keep getting higher. I came up to my parents’ to help them out and take my mom to her chiropractor’s appointment but we had to cancel the appointment because the roads are so bad. I re-injured my knee — not in the snow, but still. And the headlight on my car went out. It just keeps piling up, literally and figuratively. Roads are narrower, driving anywhere takes twice as long, and parking is next to impossible, even if you have put a chair in the street to save your spot. People are just tense. This is a hard time of year. So what is the deeper truth in all of this? I’m not sure, but I think a couple of things are true. The first, I think, is the same lesson I keep coming back to: Conflict is just part of the human condition. People are going to disagree and get frustrated at each other no matter what. There is no perfect amount of action or inaction, passivity or assertion, speaking or keeping quiet that can avoid this. There is no perfect thing to do or say that will avert all conflict. I question whether I should have pushed our subletter so much, but at the same time I feel like I had genuine concerns that it was okay for me to express. In any case, it’s time to let it go and move on. The endless post-game , play by play analysis is too exhausting. 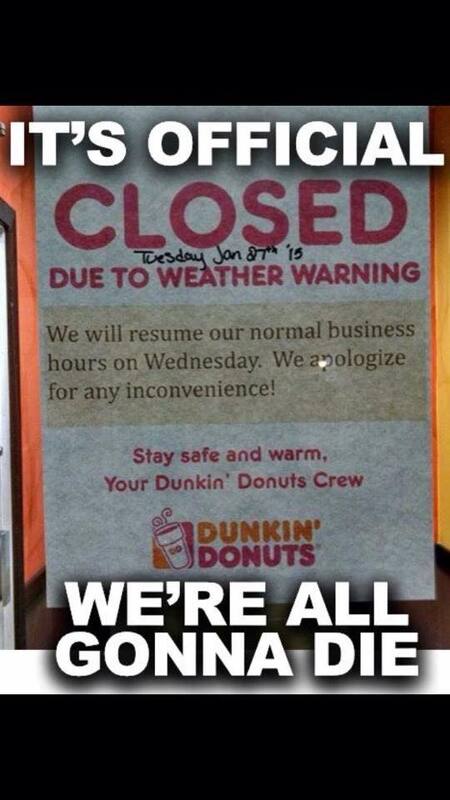 If Dunkin’ Donuts is closing, you know it’s serious. I feel your pain, even though our snow doesn’t get that bad. It’s the grayness of winter that drags me down further and further. Adding that much snow + subletter insanity to it would have me under the bed already. I hope you will be able to continue breathing deeply and re-reading this as often as necessary. Definitely a tough time of year. I function much better with sunshine and have to stay really intentional about keeping my joy this time of year. I’m trying to accept that I’m a little more “sensitive” to things like the weather than some others seem to be, and that it’s okay. Tara, thanks for coming by, and for your thoughtful comment! Yes, I totally would have cried, too, being yelled at in a parking lot. Good for you for realizing that it was her issue, not yours, and for taking care of your fierce, sensitive little girl. I love your post about your father — I’ll comment over there as well.